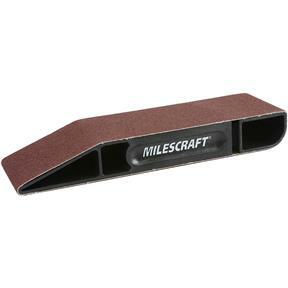 The new SandDevil produced by Milescraft delivers power tool results with hand-sanding precision. Easy to use on flat, curved, and hard to reach surfaces, making this ideal for large sanding projects as well as difficult detail work. The Clever Lever™ design allows for a quick change of sandpaper - simply draw in the lever and rotate the sanding belt to a fresh section. This reduces waste as you use the whole belt every time! Includes a standard 80 grit cloth-backed sanding belt. Sanding angles include a 3/16"r, 5/8"r, 45° and 90°. Total size is 9-3/4"L x 2-1/2"W x 1-1/4"H, belt size 3" x 21".